Ever since I read The Cure for Dreaming, I have been dying to read more from Cat Winters. I heard In the Shadow of Blackbirds is amazing (still have to read it!) and this book sounds pretty great as well. I love how Winters writes historical fiction with a twist. What do you guys think? I haven't read any of her books yet but this does sound interesting. I like the mix of historical with a little paranormal. It reminds me of Delia's Shadow which is set around the same time and deals with ghosts. YES! I remember you reviewed Delia's Shadow and I really liked the sound of that one. Thanks for visiting, Christina! Oh, I love Cat Winters, she's brilliant! 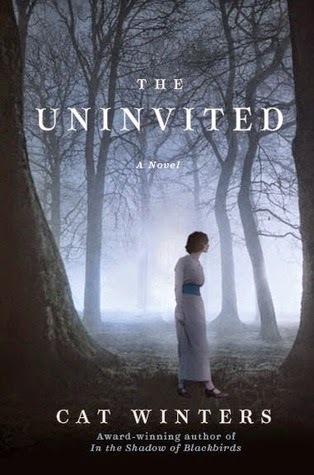 I'm definitely looking forward to reading The Uninvited. Great pick! Me too. I just need to read Shadow of Blackbirds, which I hear is awesome. Thanks for visiting, Michelle. I've never heard of her, but ghost stories are always a must. Sounds a bit like "Second Glance" by Jodi Picoult which I absolutely loved. Ohh! I haven't read that one, but I know Jodi Picoult's books are pretty great. Thanks for the recommendation and for visiting, Jen! Me too! Thanks for visiting, Tara! Yes! It definitely gives off that vibe. Thanks for dropping by, Banish. So interesting post! Like your blog and the way you write! Thanks, Diana. I appreciate the kind words. Thanks for visiting.